What happens when Pastor Josh Allen is transplanted from Seattle to the Deep South and discovers his daughter is involved with a sexual addict At the same time, one of his congregants deals with age discrimination, and he and his wife, Leah, discover a problem that will change their lives forever. As his world falls apart around him, Josh must build a new life in a town far from his Boston roots. Allen's Christian faith upholds him while he endures attacks on his simple life of helping others. Each week on the church's stage, he leads his flock, while behind the stage he fights the good fight for his family and his church. Anne Sanders became a Christian when she left America and went to work in a country whose population is less than 1 percent Christian. Having attended Harvard University at sixteen and Emory University for her Phi Beta Kappa English degree, she found intellectual pursuits more important than her spiritual life for many years. Living in a small Japanese town for a year, she pursued Buddhism, but when she got alone with God, she accepted Jesus as her Savior. 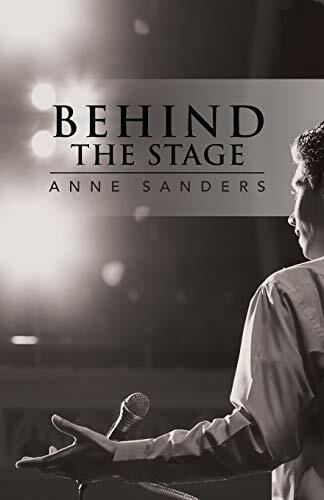 Having written for newspapers, magazines, and websites, Sanders got inspired to write fiction with Behind the Stage. Anne's website, Helping Hearts, is for the volunteer and charity-giver in all of us. It includes fun, easy, free, and more involved ways to help others. Her blog of the same name has had over 12,000 views and can be found at blog.annesanders.net.